This is an exceptional and inexpensive Ferro rod fire starter that will provide any prepper or survivalist the ability to start fires reliably in hot, cold, and wet conditions. This model is better than most in throwing off a good shower of sparks. Ferro rod fire starters offer a dependable way to start fires. 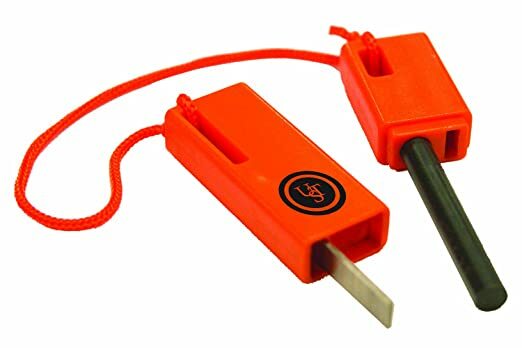 The Ultimate Survival Technologies Spark Force Fire Starter works very well and is small enough to fit in your pocket. It is actually the smaller version of the popular but more bulky model called the Strike Force fire starter, which is another very good fire starter. The Spark Force is orange so you can see it if you drop it in a wooded area, and also will not take up much space at all in your Bug Out Bag. The striker on this model has a nice sharp 90 degree edge that is superior to the thinner "hack saw" type blade that is available on a lot of strikers. If you have never used a ferro fire starter, practice using it until you get the hang of it, and have learned the best angle to make your strikes. In many ferro fire starters you have to scrape off a protective layer on the outside of the ferro rod before it starts producing sparks. So don't be discouraged if your initial strikes are not producing good sparks. It is a good idea to have several Ferro rod fire starters on hand along with tinder of some type (such as cotton balls). For the Ultimate Survival Technologies Spark Force Fire Starter, the YouTube video below compares it with several of the best ferro rod fire starters (links to each of them are also provided below). Watch the video to see these fire starters in action. In the video, a Corona Sharpening Tool is being used as the striker on each fire starter to keep the striker consistent when doing his test. The Corona Sharpening Tool really makes an ideal striking device for ferro rods. If you would also like one of those, there is a link to it below in the recommended accessories. Additionally a Survivor HK-106320 Knife & Fire starter combo is included in the links below as it includes a really good magnesium alloy fire starter and a survival knife with a full tang stainless steel blade for under $10. Some preppers order several of these and throw one in their Bug Out Bags, and car, etc. The following YouTube video is a review, demonstration, and comparison of the Ultimate Survival Technologies Spark Force Fire Starter and several of the best ferro rod fire starters that are available. "BOOM! A class above other flints! I have used many flints over the years as my only source of ignition. This flint is absolutely, without question, the best I have ever seen. It's the best by an order of magnitude. It throws a monster spark! The flint, steel, and case are of superior quality and it works so well it almost takes the fun out of it. Clearly this was designed by aliens with technology more advanced than our own. Buy this and don't look back." "A Pocketable and Very Capable Ferro Rod. This is the smaller and just as capable ferro style rod as its big brother offered by Ultimate Survival Technologies. Its very pocketable and works extremely well. The Strike Force big brother has a compartment to store a tinder cube, but aside from that, the smaller SparkForce works just as well and you will find yourself carrying this one everywhere when you might not with the larger Strike Force." "Great reliability. Amazon just doesn't have a high enough rating scale for this product! I bought this after watching a YouTube video, thanks Chris from preparedmind101, and thought it has a great shower of sparks. Could it be the fact he is just use to the product? When I received it and tested I barely had any sparks with the first strike. Then changed the angle of the striker on the ferro rod and thought it was the 4th of July and I lit a sparkler. I figured ok let's have my 13 year old daughter try it. She never tried any fire starters prior; other than a lighter for fireworks. She almost jumped out of her skin from the sparks. I laughed. You want something that works? Buy it. You want to waste your time and energy? Buy something else. Oh and as far as field use, I live in Pacific Northwest and started fires on two separate camping trips. One was when it happened to be raining." "This product is worth its weight in gold in a survival situation and small kit. I bought this at Walmart also figuring what the hell 7 bucks I will give it a try. It is excellent. The whole thing weighs about 24 grams which is nothing. The striker is not crap and gets a great spark off the rod it comes with. It also gets a great spark off other bigger ferro rods I have which came with useless strikers. This thing is great just because it is so small and will ignite a dry plain cotton ball with one spark. You should carry some cotton balls with you for emergency situations. Come one how much do cotton balls weigh? Go to the gym more if you have to. A cotton ball is a guaranteed fire for 1 minute even without a little Vaseline. Just a small touch of Vaseline makes cotton balls burn hotter and longer (2 minutes). I tried the product on dry wadded grass at that also ignited immediately. BTW be careful of the cheap Chinese knock off strikers and magnesium bars. They don’t spark or ignite they are a complete waste of money. They are worse than useless because they can give you a false since of security. Always test a product at home before you really need it." "....The SparkForce is a great alternative to the StrikeForce, much lighter in weight, but still has very solid construction and very easy to produce a stream of hot sparks. For a long-term survival situation, the StrikeForce would be my first choice, but for an emergency backup for backpacking trips, you can't go wrong with the SparkForce, which has become a permanent fixture in my backpack. Also, love the orange color which is much easier to find in my pack than my black StrikeForce." "Small and Awesome. It's super small and well built. I cut off the string and just use it without it." "This thing showers a lot of sparks! I have never used a firestarter before so it took me 3 strikes to figure out how to make sparks and 5 strikes to be accurate enough to hit the vaseline cotton ball--if I had laid-out a few more cotton balls it would take only 1 strike--this thing showers hot sparks all over. I would highly recommend it." Use at your own risk. Please note that the information provided on this web page is for information only. TopSurvivalPreps.com and it's owner have no liability or responsibility for anyone using any items described on this web site including the Ultimate Survival Technologies Spark Force Fire Starter and the other fire starter models shown below on this page.